Only one more WNR before Christmas folks, and two more before its 2009. Can you really believe that? That somehow time is linear and that the years go up, rather than down, is really just amazing to me. You know what’s also amazing? Coleslaw. In Copyright news, the MPAA has linked an increase in piracy with the current economic climate. For once, I actually agree with them. Piracy has always been linked to what people are willing and able to spend, and with Hollywood consistently making increasing profits, the MPAA need to take a look at that and realise why the piracy rate is so high. The MPAA continues their fight against movie websites, suing three more this week bringing the total to 13. But illegal downloads continue, which again links to the point above. Make it affordable, or people will look elsewhere. The lawsuit against Australian ISP iiNet continues, and iiNet are ready for a legal fight which could start in February. As part of the preparation for the lawsuit, AFACT (the Australian MPAA) spied on iiNet’s users who used BitTorrent, and even planted a ‘copyright infringing’ user into the mix to prove their point. Does that leave a bad taste in your mouth? It does mine, and I’m not even an iiNet customer. Why should corporations or organisations representing corporations be allowed to spy on us? In this case, the information was used to sue another company, but what if they used this information to sue individuals? Oh wait, they’ve done this before. Ethical, moral and legal considerations seems to be second concern to these people, not if it gets in the way of protecting their profits. Software publisher Ubisoft is dropping DRM for the new Prince of Persia game. But don’t get too happy yet, because “It’s a Trap!”. They are doing it to prove that having no DRM still means a high piracy rate, which might get people to go and buy it prove a point, which is a scenario that they’re happy with too. It’s a win win for them really. Ideally, we as users should buy the game if we like it, and not buy it or download it if we don’t. A low piracy rate + a low purchase rate should send the right message if the game turns out to be crap (early reviews say the game is pretty good, but not an instant classic or anything). I don’t think DRM actually increases piracy, I just don’t think it stops it. And since it doesn’t work, it only annoys legitimate users, which is kind of counterproductive. Back to the game that started all this negative publicity for PC gaming DRM, Spore now has reduced its own DRM. And all it took was a massive public protest and out-lash. And don’t forget the baddies behind all this is SecuROM, and guess who publishes it? That’s right, Sony. The fact that half of SecuROM’s wikipedia page is filled by the “controversies” section says something, doesn’t it? Onto Blu-ray news now, and it’s been a great week for Blu-ray. Well, actually it was last week, but the sales figures have only come out for “TDK Week”, and they are spectacular. More than $60 million is sales for the week is amazing for Blu-ray, considering the year’s previous big release, Iron Man, did less than $30m. But while this is great news for Blu-ray, it was also good news for DVD, because the DVD version sold tons as well. And the DVD version did better against Blu-ray for TDK compared to Iron Man as well, at least on dollar volume. The Batman has saved Christmas. The first day figures for TDK had the Blu-ray version selling at 30% compared to the DVD version in the US, Canada and Britain. Worldwide numbers from a week later had the Blu-ray market share drop to about 13%, which is still an impressive set of figures (this number would have been closer to 3% this time last year). Still, I think something is missing from Blu-ray, as the migration from DVD to Blu-ray hasn’t really materialized for the average consumer. What might help is Blu-ray combo discs. Remember HD DVD combos? Remember HD DVD? Anyway, combos were HD DVD discs that had HD DVD content on one side, and DVD content (playable in any DVD player) on the other. Some discs even had both formats on the same side, although the HD DVD side was limited to a single layer (15 GB). Well, it might be coming to Blu-ray as well, and I think this will be a good idea for Blu-ray, despite the BDA ridiculing the HD DVD people for doing it. If HD DVD had decided to tough it out and were determined to use everything in their arsenal, then they could have made every DVD release a HD DVD combo, instantly taking the HD DVD to DVD sales ratio to 1:1. Blu-ray can now do this as well, if they’re desperate enough (will lose a lot of money in the process though). And finally in gaming, there’s a free Xbox Live Arcade game available at the moment. I’ve downloaded it, and you don’t need a Gold account either. The way that Xbox Live has been integrated with the Internet is now quite impressive. I was actually able to log into my Xbox Live account on my PC, and schedule the download of this free game to my Xbox 360 all without turning the console on. Plus, my Fallout 3 achievements from my PC version of the game now shows up in my Xbox 360 gamer profile, and vice versa. PC gaming is on the decline, but it’s still huge for certain types of games, and if Microsoft can pressure publishers to include “Games For Windows” in all PC games (thus making sure that an Xbox 360 version will exist with the same set of achievements), then that will be a big boost for the Xbox 360 as well. Overall, there’s a lot of good news for the Xbox 360 at the moment. 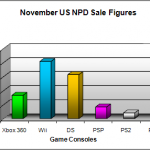 The Wii is doing amazing things in sales, but as you’ll read about in my November NPD sales figure analysis, the PS3 is struggling. Sales are down compared to last year for all three of Sony’s console platforms, which isn’t too surprising given the current climate, but it’s made worse by the fact that every other console increased in sales: Wii, Xbox 360, DS, some by significant numbers (Wii – sales up 108%!). Some analysts are blaming this on poor HDTV sales. This kind of make sense, except the Xbox 360 is also a HDTV requiring console, so why has it not dropped in sales? I think the PS3 is supposed to drive HDTV sales, not the other way around, to be honest. But the easy solution is to drop prices, but Sony won’t do it claiming the PS3 is still the best value console around. That’s true, but value is relative. It’s as if a car manufacturer includes all extras as standard, except the price has been raised by a couple of thousand. Yes, it’s good value if you need all the extras, but what if you don’t want a sunroof? Then the car is just plain expensive, despite it being worth the price. This is basically the effect of the PS3 also being a Blu-ray player. In another year, Sony could have afforded to take a loss and drop prices, but not in a year where their predicted profits could drop by a massive 72%. That’s it for yet another week. There’s no holiday break for DVDGuy, so I’ll be back same time next week with another news roundup. Even if there isn’t any news to write, in which case I’ll ramble on about something. So same as usual then. This entry was posted on Sunday, December 21st, 2008 at 4:50 pm	and is filed under Copyright, High Definition (Blu-ray/HD DVD/4K), News Roundup, Nintendo Wii, Wii U, Switch, PS3, PS4, Xbox 360, Xbox One. You can follow any responses to this entry through the RSS 2.0 feed. Both comments and pings are currently closed.